I've always been interested in the aesthetic and visual aspects of sports. I spend a lot of time researching the history of the logos, uniforms, and iconography of each sport contributes to personal style, civic pride, and modern religious belief. Finding new ways to interpret and apply athletic design is the basis of my interest in fashion and apparel design. Alternate logo design for Brooklyn Nets using profile view of Brooklyn Bridge. Intended for use as sleeve patch or official seal. Interpretation of Milwaukee Bucks Wisconsin-outline tertiary logo in the shape of Bucks County, PA, where I grew up. Apparel design honoring historical colloquial name for the Northwestern Football team before taking on the Wildcat nickname. Also, the pattern of Thin-Thick-Thin stripes in athletic design were first worn by Northwestern and are known throughout the design world as "Northwestern Stripes.” I wanted to highlight their presence and importance to the university and create a visual element for fans and alumni to rally around. You'll see both of these design in the stands at Ryan Field on Saturdays in the Fall. Select examples of sports-uniform inspired sewing projects. Detail of logo design and stitching. Combination of hand and machine-sewing. Recreation of early-era NFL team logo. Sewn in felt on a thermal knit long-sleeve. 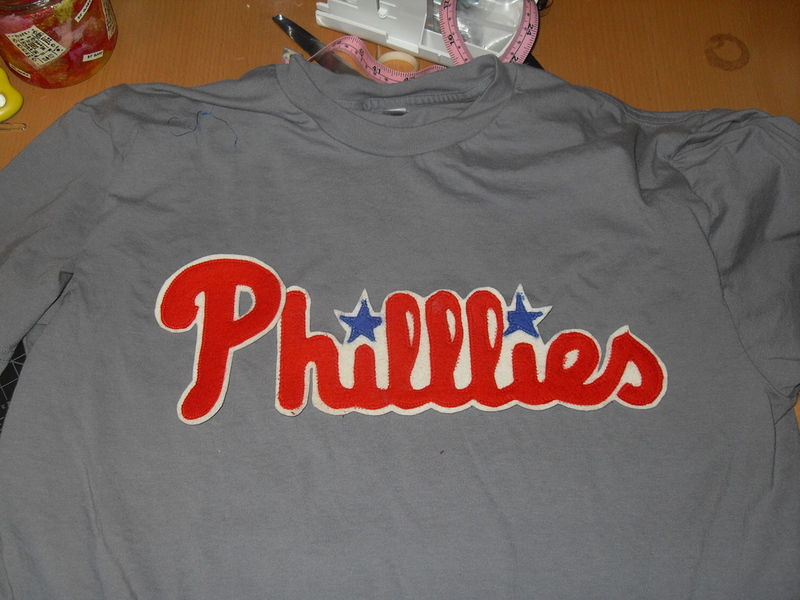 This custom Phillies jersey honored J.A. Happ, who went to Northwestern University, my Alma Mater. I added a Northwestern Athletic "N" patch where the TV number usually goes on the sleeve.